Koishi Komeiji (古明地 こいし, Komeiji Koishi) is Satori Komeiji's younger sister. To escape the fear and hatred which other beings feel towards the satori species, she attempted to destroy her mind-reading ability by closing her Third Eye. However, this had the side effect of sealing away her own conscious mind, causing her to lose all thoughts and motives; she could no longer be hated, but neither could she be loved, or even remembered by people who saw her. 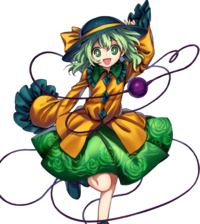 Koishi first appeared as the Extra stage boss of Subterranean Animism, later as a playable character in Hopeless Masquerade and Urban Legend in Limbo. Koishi's presence cannot be "felt" by anyone unless she has entered their direct field of vision, and is forgotten as soon as she leaves it. In general, she doesn't have a personality. However, children enjoy her presence as one of an imaginary friend, whom they forget about once they grow up. However, as Satori's presence has been made known, even Koishi has begun to be recognized as of late. As her actions are controlled entirely by her subconscious, Koishi's presence cannot be noticed by other beings unless she allows it, even while standing in plain view because she's closed her mind, or her Third Eye. Likewise, her older sister's ability to read minds has no effect on her, as she does not technically have a mind to read; that's why she said, "my sister can't win against me." Even someone who manages to communicate with Koishi will forget about her after she leaves, unless they already knew of her as Satori's sister. Some children are immune to this effect due to their still-developing minds, leading Koishi to become their "imaginary friend", though they will forget about her when they grow up. Other than making others unable to perceive her existence, it also makes the act of doing so difficult to perceive. Practically, without being noticed by tengu or the other youkai, she climbed Youkai Mountain. Even the optical camouflage was spoiled. The youkai satori, on whom she and her older sister are based, by the actions of the humans' unconscious, they saw painful experiences. Due to this it is also not known if this ability was spoken of cynically in the past. However, since she closed her third eye which can read minds, she became unable to read others' minds. As she said herself, "reading people's minds is depressing, there's nothing good about it." She can manipulate the unconsciousness of every living thing around her, allowing her to make them see everything she desires and make them confront their own weaknesses hidden inside their hearts, as seen in lot of her Spell Cards. 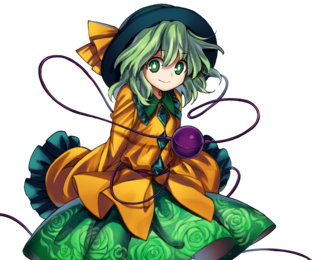 Koishi currently resides at the Palace of the Earth Spirits, but she is also a laywoman in regards to the Myouren Temple as a recent convert to Buddhism, at Byakuren Hijiri's request. Koishi wanted to receive the blessing of Kanako Yasaka so she could give her own pets power like Satori's pets were given, so Koishi does apparently have pets. During and after the events of Hopeless Masquerade, Koishi now possesses the original Mask of Hope that once belonged to Hata no Kokoro before she lost it. Koishi found it while wandering around Gensokyo, and because of this, she temporarily obtained the emotion of hope. Koishi Komeiji (古明地 こいし) is her full name. Her surname Komeiji (古明地, lit. "ancient-bright earth") is an actual Japanese surname, seen mainly in the Yamanashi prefecture. There are two common ways to interpret her given name Koishi, based on which kanji are used. The kanji in "恋思", though not a Japanese word as a compound, mean "will/thought of love." The second writing, "小石", means "little rock." This could be connected to her ability, indicating her lack of presence, as she is often compared to a little rock sitting on the side of the road in official texts. 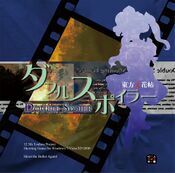 The ending of Koishi's storyline in Hopeless Masquerade suggests the origin for the name of Koishi. "Once hope is lost no one will be able to see her (Koishi) again, just like a small rock (小石, pronounced koishi as well) on the roadside." 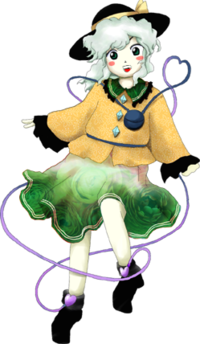 In Subterranean Animism Koishi has wavy, green or greyish, short hair and dark green eyes, wears a black hat with a yellow ribbon around it. A closed, blue-purplish "third eye" is positioned over her heart, with cords wrapped around her torso and attached to each of her ankles. She wears a yellow shirt with diamond-like blue buttons and dark green collar. The skirt is also green with a faint flowery pattern, but is lighter. Her socks are black. As of Hopeless Masquerade, she has bright green hair and dark green eyes. Her "third eye" is also towards a purple colour. Satori and Koishi's design may have been inspired by the 1939 painting by Frida Kahlo titled "The Two Fridas". The subject is essentially two identical women (sisters/clones/twins...) with visible hearts and external arteries that seem to connect and wrap around their shoulders and arms, where one of them has a cut artery and a pair of scissors in hands (resembling Koishi, who has closed her third eye). During the main events of the main scenario, it's said that Koishi was around the whole time the heroine was in the Underworld, but they never noticed her. After the events of the main story in Subterranean Animism, Koishi heard that her sister and pets fought a human from above ground, and also heard about Utsuho Reiuji's new power. Desiring that kind of power for her own pets, she decided to go to Gensokyo to pray for divine blessings. Thanks to her unconscious ability, she managed to reach the Moriya Shrine atop of Youkai Mountain around the same time the Heroine decides to pay a visit to the Gods in the Mountain in the game's Extra Stage. Koishi provokes a fight, and is defeated. After this encounter, however, Koishi somewhat regretted having closed her third eye and became curious enough to want to start actually meeting people. Koishi tumbles across Hata no Kokoro's lost Mask of Hope and picks it up. This bit of hope added to her otherwise emotionless state allows her to gather popularity when she would otherwise be invisible. She ends up so attached to the mask (subconsciously) that she refuses to return it to Kokoro and ends up keeping it after the conclusion of the story. 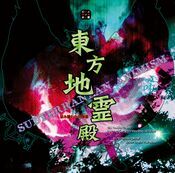 While talking about the underground youkai, Byakuren Hijiri becomes interested in Koishi, as she thinks her state of mind – one of emptiness – is quite close to enlightenment. At the monk's request, Koishi converted to the Buddhist faith. Koishi's most important relationship is her older sister, Satori Komeiji. Despite Koishi closing her mind and seemingly whimsical wandering, as well as the fact that even Satori has trouble "seeing" her, Satori does worry about her. 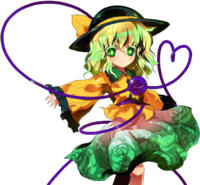 In Koishi's profile, it is said that she met a human at the Moriya Shrine at the top of the Youkai Mountain who made her regret closing her third eye and want to learn more about this human. Though it may seem like this was talking about Sanae Kochiya, once put in to context by the extra stage of Subterranean Animism, it is clear that the human it was talking about is either Reimu or Marisa. Koishi is also acquainted with Satori's pets, which include Rin Kaenbyou and Utsuho Reiuji. 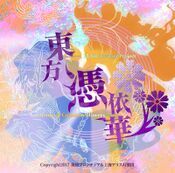 Byakuren has an optimistic view of Koishi's condition, believing that she is close to enlightenment, and invited her to attend Myouren Temple from time to time. Koishi accepted. Considered a nemesis by Kokoro due to Koishi stealing the Mask of Hope. 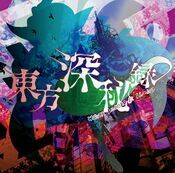 Koishi's musical theme, Hartmann's Youkai Girl, may refer to Eduard von Hartmann (whose most famous work is entitled The Philosophy of the Unconscious) or Heinz Hartmann (as many of Koishi's spell cards seem to make references to ego psychology.) The track itself is also arranged so that it has symmetrical parts, making it sound remarkably similar to itself even when played reversed, possibly as a reference to the practice of backmasking. Koishi's design can also be a reference to the game Ibara, as both Koishi and the Rose sisters have white hair and has a lot of reference to roses (although roses in Ibara are point items instead of bullets). If her color scheme is inverted, she will somewhat resemble her sister Satori, and vice versa. One of her alternate costumes in Hopeless Masquerade borrows her sister's color scheme. Like Satori, she was a youkai who has the ability to read others' minds. However, knowing that people don't like having their minds read, Koishi closed the third eye that gave her the ability to manipulate the subconscious. As a result, she lost her ability to read others' minds, but in return she gained the ability to take action unconsciously. The denizens of the underground no longer hated her, but at the same time, they never feared her and animals no longer loved her. The ability to read people's mind is the strength of one's own mind. Closing off that ability because it's hated is just running away, and is no different from closing off one's own mind. It's effectively pushing away others' feelings and shutting down. She became a youkai who wandered to and fro aimlessly. Personally, she thought it was fun, so it wasn't really a problem. People around her felt a little sorry for her. Even her older sister, Satori, is unable to read Koishi's sealed-away mind, and doesn't really know where she goes or what she does there. Just like a pet cat, she leaves and returns and leaves again according to her own whims. Satori took pity on Koishi, ordering her pets to play with her and giving her some pets to keep as her own. She thought that taking care of the pets might give her a purpose, and it might enable her to begin opening her mind to others again. Indeed, it seemed that Koishi began to change, ever so slightly, after she began to raise her pets. She heard that a human had come from above ground and had fought with her sister, Okuu, and the other pets, and was amazed at the incredible power-up Okuu had gotten, so she decided to go see the above ground world herself. Because she could act unconsciously, she remained unnoticed. She could go above ground, sneak past sleeping shrine maidens, or go into the mountain the tengu guarded, and nobody would take notice of her. In a way, it was convenient, but she was also lonely. However, she had no mind capable of feeling this loneliness. At her destination, the shrine atop the mountain, she happened to meet a human. Her meeting with this stranger changed her mental state ever so slightly. She thought, how amazing it is to meet such an interesting person, and wanted to know more about her. For the first time, she regretted having closed her third eye. I'll start by inviting her underground to the Palace of the Earth Spirits. I wonder what kind of fight she had with my sister, Okuu, and Orin. I wonder what kind of youkai she's fought with. I want to hear her endless stories. When she thought this, Koishi felt the lid of her third eye begin to shift a little. When she came to, she was blended into the crowd. Not a soul noticed it. Every day, she lived like that - without dreams, and without hopes. her daily life changed, just a little bit. Attacks that can be set are heavy melee, heavy ranged, and special attacks. the reactive icon in the gauge will light up. Draws the opponent in to a sea of random danmaku and captures them. even if there is a bit of distance, it will ensnare the opponent without question. With her attacks being prepared subconsciously and then executed at her own will, she’s a character with unprecedented specialization. Without a plan you’ll shoot yourself in the foot, but by making the most of the circumstances it’s also possible to counterattack with immense power. With that, her Occult Attack is “I’m Coming to Get You Now”. Koishi makes a call to the character near her, and when it hits, she moves to attack them from behind. Each time you make a call its range increases until there’s finally no escape. ↑ Symposium of Post-mysticism: Koishi Komeiji article - "A youkai invisible to adults, and only visible to certain children. However, even those who played with them in their childhood will completely forget that they existed once they grow up. Has anything like that ever happened to you? They are often referred to as 'imaginary friends'. Koishi is, no doubt, an imaginary friend." ↑ Double Spoiler: Embryo's Dream - "They say the human embryo dreams in the mother's womb. What a scoop! The dreams' contents are...microbes, fish, and dinosaurs...they say." This page was last edited on 30 December 2018, at 17:04.